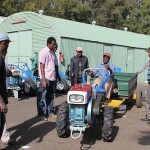 Learning from the experience of Asian countries such as Bangladesh, CIMMYT (the International Maize and Wheat Improvement Center) and its partners are testing small, inexpensive, and easy to maintain two-wheel (single axle) tractors in the Ethiopian Highlands. The project is supported by the Africa RISING (Africa Research in Sustainable Intensification for the Next Generation) project funded by USAID (United States Agency for International Development). 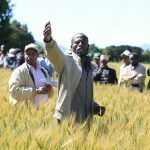 Since the Growth and Transformation Plan was established by the Government of Ethiopia in 2011, tremendous progress has been made in the agricultural sector. Farmers have gained access to better seeds and adequate quantities of fertilizers. Yield have increased dramatically and improved connections between farmers and the market means higher income for farmers and more food available for urban and rural net food purchaser. 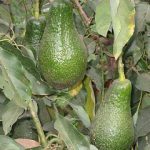 Sustaining such an increase in agricultural output, however, will require a proportionate increase in farm power (to plant larger areas, handle larger volumes of inputs, harvest, thresh, and transport more crop, etc). As a response, the Ministry of Agriculture and the Ethiopian Agricultural Transformation Agency developed a draft national mechanization strategy in 2014. 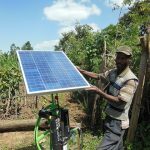 The aim of the strategy is to increase the farm power available to Ethiopian farmers 10 folds (from the current 0.1 kW/hectare to 1 kW/hectare) by 2025, with at least half of this power derived from fuel and electric engines. Large tractors (with four wheels and two axles) are well suited to large-scale and medium-scale Ethiopian farmers. But these farmers only represent about 10% of the estimated 14.7 million farmers in the country. Is there any alternative to the maresha plough and hand tools for the majority of farmers in the country, to support the productivity of their farm and reduce their labour intensity? Two-wheel tractors appear better suited than four-wheel ones in the Highlands of Ethiopia, which are characterized by small and fragmented farms and hilly terrain. They are also very versatile and can be used for seeding, pumping water, threshing wheat, transporting loads of about one tone, and many more uses. Although two-wheel tractors and their attachments are relatively cheap (a two-wheel tractor costs about 28,000 ETB), it is evident that most Ethiopian farmers won’t be able to purchase them individually. Still, they could access mechanization services, delivered by dedicated well-trained service providers. This model – which has been adopted in Bangladesh where a single two-wheel tractor can service up to 30 farmers – is the model tested by CIMMYT and its partner in Debre Birhan, Lemo and Sinana woredas. 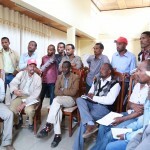 From 1 to 5 June 2015, 6 service providers from Debre Birhan, Sinana and Lemo woredas are being trained in the operation and maintenance of the two-wheel tractor. They are also being trained in business, financial management and marketing. A demonstration will be organized on 4 June 2015 at ILRI Campus at 9h00. After the demonstration, there will be possibilities to interview project members, trainers, and trainees.